Gajathandava is one of the samhara forms of Lord Shiva. The left leg is in chathurbhanga pose. For this form he received the names Gaja murti, Gajanthandava or Gaja samhara murti. The leg raised and twisted in dancing pose is known as the chathurbhanga pose. This late piece has a round face and a round pair of eyes. 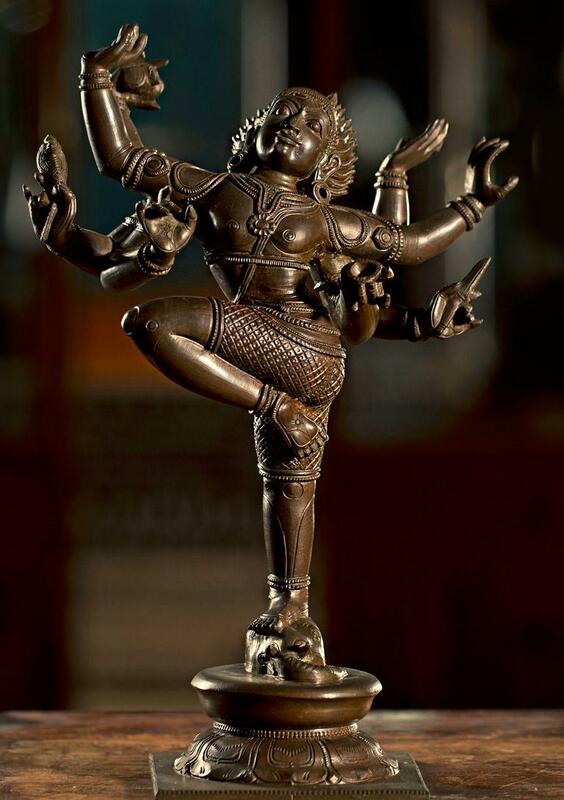 This image of Shiva has 8 arms. Two of the left arms carry the bowl and stick. The other two hands carry the drum and the serpent. All the other hands are in dancing gestures. Below the right foot of Shiva is the head of the elephant while the left leg is raised and twisted in dancing pose.